Update: Kawa Flats in Ka`u is now open to both directions of traffic. The National Weather Service in Honolulu has discontinued the Flash Flood Warning for portions of Hawaii Island and have replace it with a Flash Flood Watch through Sunday afternoon (Dec 4) for all Hawaiian Islands. The combination of deep tropical moisture and an unstable airmass will result in potential for heavy showers and thunderstorms across the state through the weekend. Rainfall rates from heavier downpours and thunderstorms could cause streams to quickly overflow their banks leading to flash flooding. A Winter Storm Warning is in effect for Hawaii Island summits through 6 p.m. Saturday (Dec 3) for summits above 11,000 feet. Heavy snow with accumulations 20-30 inches today through Saturday on summits. The heavy snow, drifting snow, strong winds and freezing fog will make for dangerous travel via car or foot. 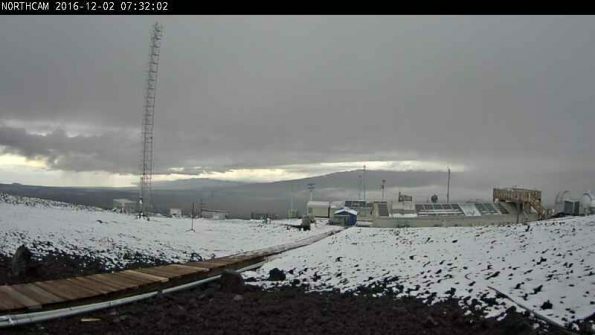 Mauna Kea Access Road to the summit is currently closed. Winds on the summits are south 10-20 mph with higher gusts. Temperatures in the mid 20s to lower 30s. Visibility is below 1/4 mile at times. A Winter Storm Watch will go into effect Sunday morning through Sunday night (Dec 4) for Hawaii Island summits above 11,000 feet. Accumulations and timing up to 12 inches of snow expected tonight and saturday at the summits. An additional 12 inches of snow is possible Sunday and Sunday night. Summits will experience dangerous driving and hiking conditions due to heavy snow blowing and drifting snow and freezing fog. Winds will be from the south 10 to 20 mph with higher gusts. Temperatures will be in the mid 20s to lower 30s with visibility less than 1/4 mile at times. 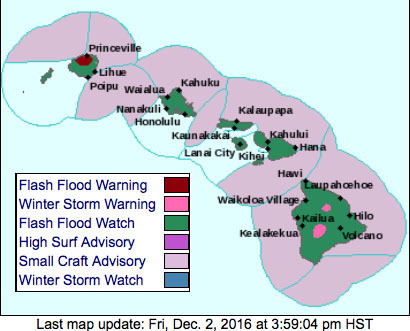 A High Surf Advisory is in effect until 6 p.m. this evening (Dec 2) for Hawaii Island east facing shores along south, north and east coasts. Surf in the 6-10 foot range is forecast. Surf will remain at and just above advisory levels today then gradually begin to trend down by tonight through the weekend. A Small Craft Advisory is in effect for Hawaii Island windward, leeward and southeast waters until 6 p.m. Saturday (Dec 3).